I do not think I have ever been so simultaneously excited and nervous for something. Well, actually when I was pregnant and about to give birth I was feeling the same way. I knew a lot of work was up ahead, but I was more then ready for the results of all of that hard work. The only difference in this is that instead of 9 months I get 6 weeks. I also am replacing the squishy and adorable baby for a new and improved room! The One room challenge starts today, and every Thursday from now until November 12th I will share the progress on this room. The big reveal will be on the last day of the challenge. Talk about lighting a fire under my a$$ to get this done! 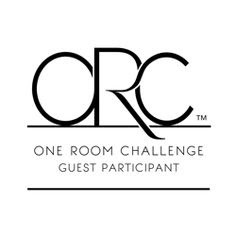 I am taking part in the one room challenge that Calling it home hosts twice a year. There will be the featured batch of designers and then a bunch of other blogging people playing along. I am one of those other people. 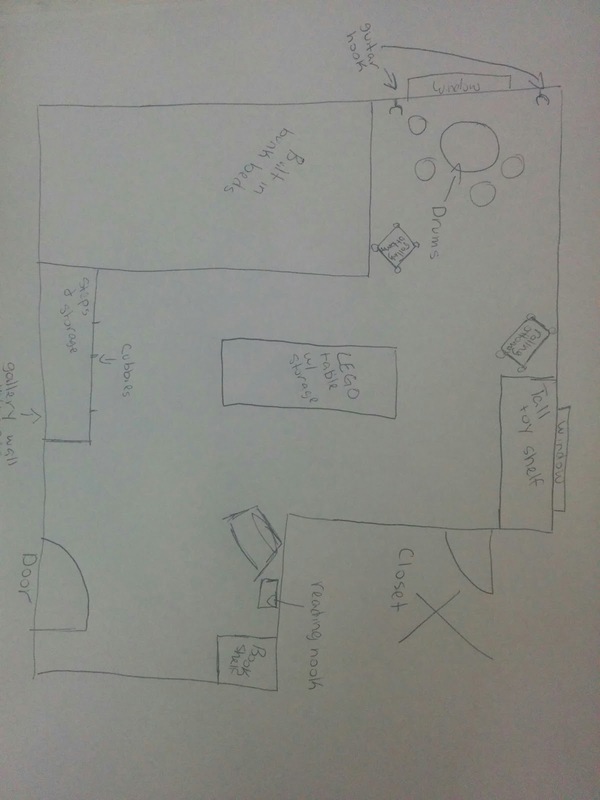 I will be redoing my boy’s bedroom for this challenge. It has been a long time coming. Looooonnnng time! My boys are 5 and 4 now. They have been sleeping on a toddler bed and a mattress on the floor. No joke. Caleb had a twin bed, which he broke. Gavin almost always sleeps with his big brother, even though he has a bed of his own. I was going to purchase them new matching twin beds when a idea to maximize space came into my head. However, the store bought bunk beds left a lot to be desired. I always had plans to create our own, DIY style. Life happened, things got delayed. 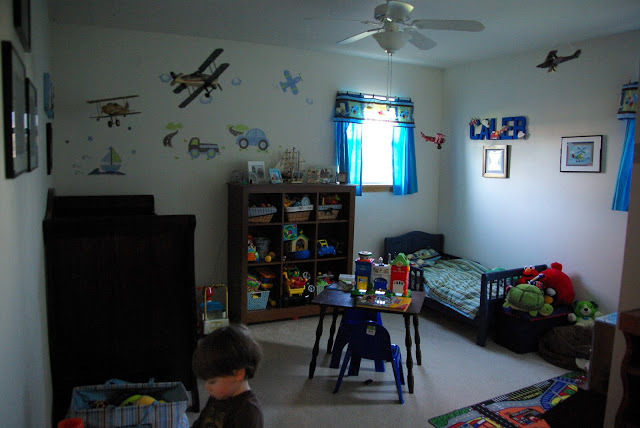 I am done with a outdated, not done, disorganized and too young bedroom for my boys. So the before pictures are from two years ago. 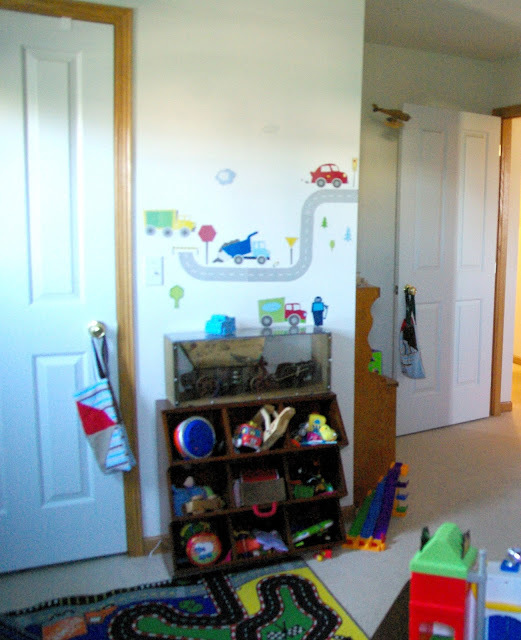 The room looked exactly the same, just with more big boy toy’s and less Elmo toy’s. Replace the crib with a twin bed that was eventually broken. 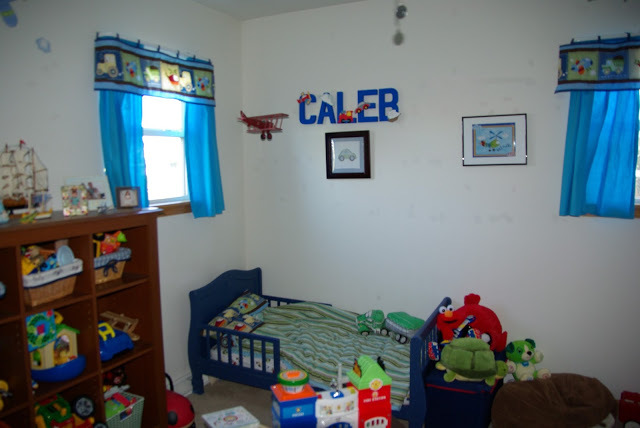 The wall decor, sad decals on the wall, curtains made from the crib bumper, all the same. A time warp of baby boy decor that never grew with them. It is time to give my big-ish boys’ a big-ish boy bedroom. This is how it has been, with the same fake wood trim, white-ish walls. It is all boy and all blue accents. A little too cutsey for me and my growing boys. Caleb and Gavin are ready for a big boy space. The requests are a LEGO center for Caleb and a skateboard ramp for Gavin. One of those things is on the to-do list. Can you guess which one? ORGANIZE and CLEAN out toy’s!!!! The above picture is my very not accurate sketch of the dream space. With the windows where they are and the closet the way it is there is one way for the bunk beds to go. Which limits any other way of setting up this room. Only so much will fit in without it being too cluttered. My boys need room to play so the goal is for storage for toy’s but leaving ample floor space. I put together a simple dream board of a few things I am looking for in this room. A idea board for this space. I plan to have bold colors of blue and green (Caleb and Gavin’s favorite colors) with accents of orange. Not sure how the orange will fly but I am loving that color currently and think it will go well with the room. 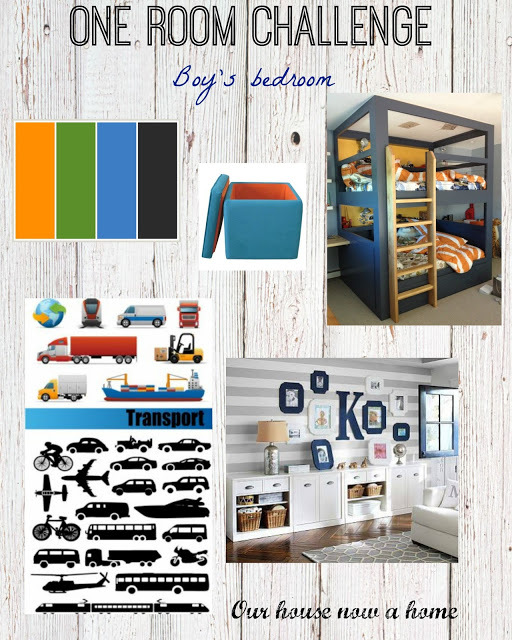 I want to have a rustic, boy, transportation themed room with lots of storage I am cheating here as we already have some great hanging antique wood airplanes in their room and a few car specific decor pieces we have inherited. These are coming from their old bedroom and should work well with the more mature look. Mature for a 5 and 4 year old. So I am expanding on their already established theme in their room. Just updating the space, making it function for my growing boy’s and their needs. 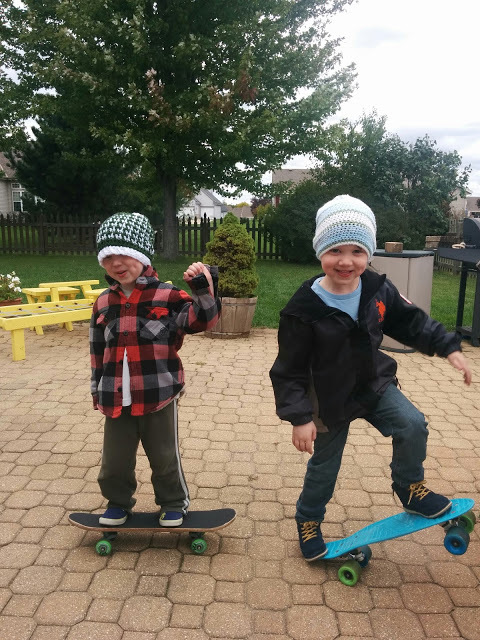 Their drum set, acoustic guitar, LEGO building, skateboard obsessed and burgeoning reading boys. Seems simple! I will also be creating some built in bunk beds that will hopefully last them a long time and allow even their eventual teenage selves to sleep in. I want to do all of this while bringing in function, organization and a rustic element. Yep, all completely doable and cohesive. This may be a big time hot mess, train wreck. Then again the train would fall into line with the theme of transportation, so I am going with it! Train wreck and all! 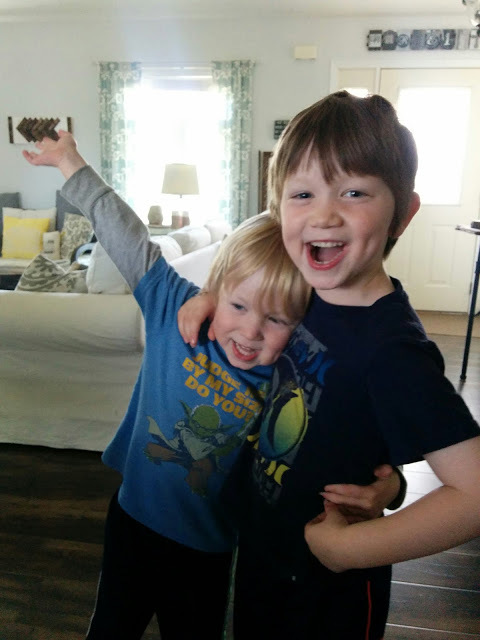 The recipients of a new room in 6 weeks, Caleb and Gavin! The two that get to sleep in their sisters room or in a mess for 6 weeks… these guys!! Are you one of the crazy bloggers taking on this challenge too? I am so eager to get to know everyone else taking part in this challenge. It will be a long journey but so worth it in the end. Be sure to follow along on my journey and the other participants. You can go here to follow along. Love what you've got planned so far Emily! Can't wait to follow along! Thank you so much! It is fun following along with everyone else! Yay, I'm doing a kids room too. I'm so glad to have bloggy friends for support and motivation for this challenge! Love what you have planned for your boys' room. They are too cute! I am beyond happy to have people I know doing this too. When we are all up at midnight the night before the reveal we can lean on each other for support. We only have 6 weeks! I am excited to see what you do with your girls bedroom! I plan on following along as I redo my boys room in a Star Wars Theme! Sounds fun! There are some great possibilities for a Star wars themed bedroom. this room is going to be so cool! Love the bunk beds and the colors chosen. Thank you! I have so much work to do but am really thinking it will turn out fun for them and functional for me. Looks like you have a lot of fun things planned for your two boys! Excited to see how the space turns out. Thank you! I worry I might have too much planned, only time will tell. Yay Emily! You boys are so cute! I love your plan, it will be so fun to see how it turns out! Thanks for the love on my blog…I had better get to work! 🙂 Legos…always an issue, can't wait to see your storage table! Thank you! It will be fun to see the transformations with everyone's rooms! 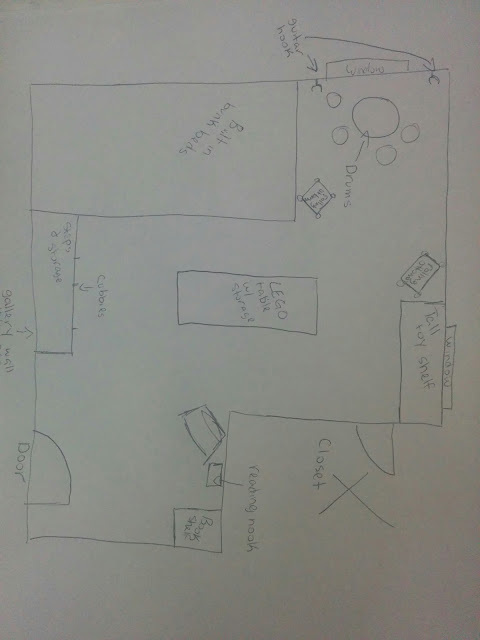 I LOVE your room plans Emily! It's sooo cute! I wish I had a reason to do the same in my sons room. He doesn't sleep in it yet, so I just can't justify it. LOL! I'm excited to follow along!! Thank you Iris! I am sure when he gets older his room will be gorgeous just like the rest of your home. I am looking forward to watching you do your thing for this challenge too. You have done this before, I am terrified! Your boys are adorable! I love seeing boy spaces because we don't do those over here. Your plan looks great and I'm excited to see the bunkbeds! Thank you! I am lucky because I get to do the girly thing with my daughter and then all of the boy stuff with these two guys. Adorable boys:) Looking forward to seeing your plans come to life! Love the inspiration, I almost went with a Big girl room for my daughter as well. Can't wait to see what you come up with! Thank you! I am ready to get working on it and already feel behind! What cuties!! Looks like we are in a similar situation with our "before" rooms. Fingers crossed we both can pull it off in six weeks! I'll be rooting for you! I am excited and so nervous to get it done! I made a lot of progress this weekend, the pressure is on! So happy to have others to relate to with this craziness. Love the vision board. The bunk beds will turn out awesome and so excited to see. Will be following along to see your progress. Your boys are too cute! They will love their new room, especially the awesome bunk beds! Best of luck! Thank you! They are very excited for the bunk beds, and impatiently waiting for them to be done. I love your ideas for the room, I look forward to following along! And your boys are adorable! Yay! That is exciting!! I can't wait to see what you do. Hope you're feeling better too! Thank you Heather, I am feeling much better. Still have a rough sounding voice, but I am almost back to normal with energy. I have a 'big boy' room on deck for the challenge too! Although my big boys aren't as big as yours yet (1 and 2). Looking forward to seeing your progress! Yay, a fellow boy bedroom makeover! SO exciting to have someone who is going through the same thing as me. Although yo doing it with even smaller kids, you are a superwoman! I can't wait to see what you do with your room! I love the built in beds and the vision board you created! Isn't this fun doing this and seeing everyone's transformation? Oh, wow! Built-in bunk beds and sibling sleepovers over the next few weeks…you are brave! Love what you have planned and can't wait to see the rest!